The BoldGrid Pro bundle allows you to easily build and deploy beautiful WordPress websites. 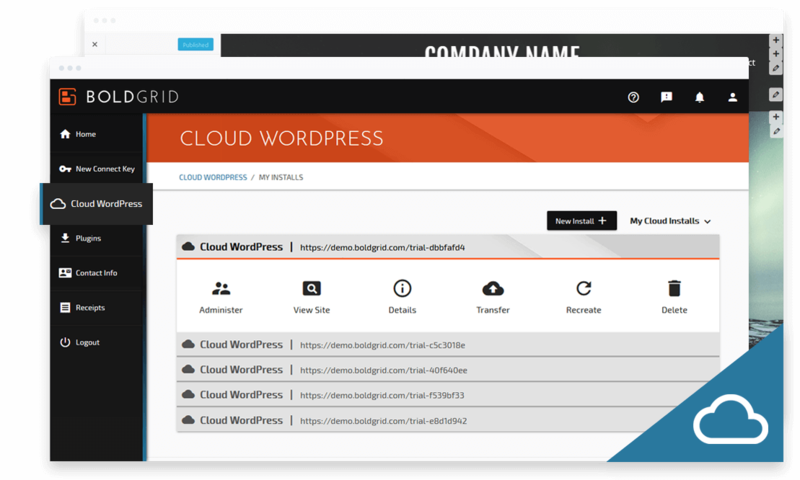 Use BoldGrid’s Cloud WordPress functionality to build websites in the cloud, then easily transfer those sites to your preferred host. Cut days, or even weeks from your design with advanced customizer access. Quickly deploy as many Cloud WordPress installations as you need (premium only, free limited to one). Use your multiple installations to show clients multiple designs. Easily transfer the site you need to your preferred host, delete the rest with a single click. Use Cloud WordPress to test plugins and customizations without ruining your live production site. When you’re finished, simply delete the Cloud WordPress installation. Edit any element from within the customizer. Quickly adjust fonts and font sizes for headers, subheaders and website copy across your entire website with a simple, intuitive interface. Easily add background images or colors with a few clicks. Use the Custom JS and CSS options to fine tune your site. Use the “Suggest Palette” feature to have BoldGrid automatically recommend beautiful color schemes that you can apply to your entire website with a few clicks. Save your favorite color palettes for later use. BoldGrid enhances and refines the WordPress experience for Professionals. Learn how BoldGrid can save you time and spare you from frustration. 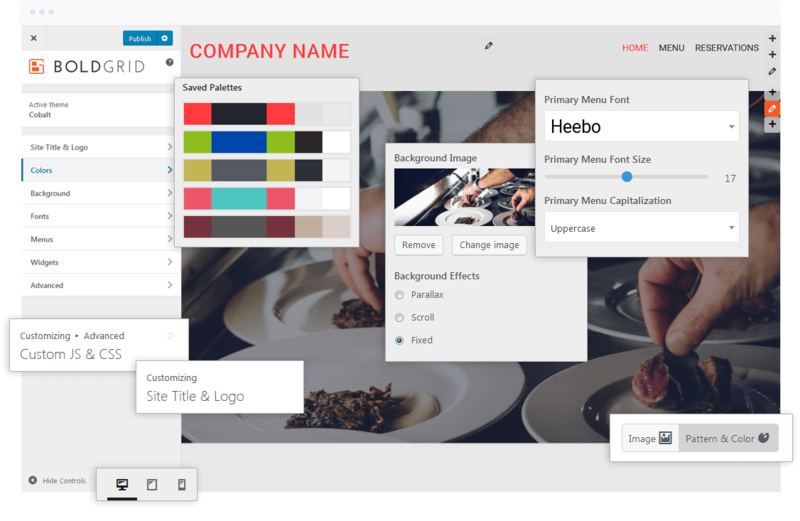 Quickly edit many elements of your theme from one simple menu such as site title, logo, color palettes, fonts, background images and effects, menu options and location, header and footer widgets, and more. Drag and drop your text, images and Blocks, or even entire blocks of content to exactly where you want them. Generates clean HTML code. Create multiple mockups in minutes by swapping out Blocks. All BoldGrid themes are responsive out of the box so that your site looks great no matter how it is viewed. Our unique Grid system will ensure your content stays optimized for mobile viewing and across all browsers. Activating the Inspirations plugin allows you to easily browse, select, install, and customize free BoldGrid themes from within your WordPress admin area. 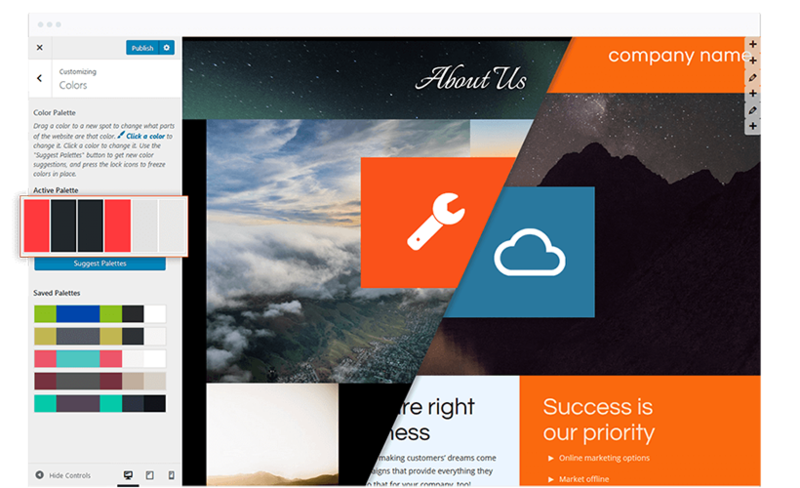 Themes include various page sets, integrated plugins, and more to give you a head start. And thanks to integration with top image banks, your media gallery is already robust with both free and premium content. Blocks are blocks of content you can customize or create for yourself. Easily drag and drop content within your Blocks and even slide entire blocks to where you want them. Every theme includes a variety of Blocks so that you can try different design approaches with ease. BoldGrid does not limit you. You can use your own custom WordPress themes or third party plugins as needed. And BoldGrid generates pristine code so that you can easily navigate source code and make your own customizations. You can easily organize and replace images within your Blocks and resize them directly on your page. BoldGrid uses API integrations to allow you to download free images and premium content directly to your site from Flickr and Fotolia. With BoldGrid, WordPress professionals can dramatically reduce the time spent on tedious or routine WordPress tasks, making the CMS the perfect solution for you and your clients’ needs. Spend your new free time dazzling clients, organizing your business, and being creative as you were meant to be. Add and edit content exactly as your visitors will see. BoldGrid generates clean HTML without using shortcode. Better Customizer control, integrated image banks, and WYSIWYG editing are only a sample of BoldGrid’s workflow improvements. We followed strict standards when creating our system so it is easy to follow. Ready for some code? See our Documentation.